Chartbeat recently shared some interesting data in a NiemanLab article indicating traffic generated by mobile Chrome’s “Articles for You” feature (also known as “Chrome Content Suggestions”) is up 2,100% in one year, and is now generating a whopping 341 million visits per month. Chartbeat asserts that this under-publicized feature, now driving as many referred pageviews as Twitter, may be the next major traffic driver for publishers. In case you’re not familiar with Articles for You, it’s the article suggestion feature you see when you open a new mobile Chrome tab. The image above shows what it looks like on my Pixel. A substantial new source of traffic is always welcome news to publishers, especially to those who have struggled to maintain traffic numbers following changes to the Facebook algorithm earlier this year. One thing I need to point out right off the bat, however, is that Articles For You is not the 4th biggest source of referral traffic overall. This story was widely misreported in the SEO community, but to be clear: this is specifically for publisher sites who receive traffic to article content. If you’re a B2B, ecommerce, or other non-publisher site, this referral source is probably not relevant to you — at least for now. A few days after the Chartbeat article was published, Parse.ly published a very similar article on their blog, Google adopting the strategies that made Facebook successful in news referrals. 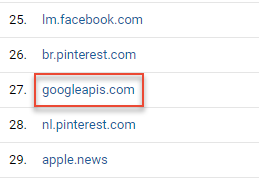 In it, they observe that traffic from the referral source “googleapis” increased 1,200% in 2017. Aside from the significant difference in the percentage increase reported by the two platforms, Parse.ly also includes an additional source of traffic for articles suggestions that Chartbeat doesn’t: Cards that appear in the Google App and the Google Feed (you can find the latter by swiping right on many Android devices). I wrote this article for State of Digital Publishing that goes into more detail about the difference between these sources and some considerations for tracking them, so check that out if you’re interested in understanding more about the nitty-gritty details of this source. Since Articles for You mostly uses AMP (about 72% according to Chartbeat), that’s where you’re going to see the traffic if you’re using a separate Analytics property to track AMP traffic (as per Google’s guidelines) — just something to keep in mind. If you’re not using AMP, just make sure the property or report suite you’re using includes mobile traffic. How Does Google Determine What Articles to Suggest? Before I dug into this, my initial thought was that article suggestions would be based on Google News settings. It makes sense, after all, since many Google News users have already taken the time to specify their interests and preferred sources. But from what I can tell, Google News doesn’t appear to play a role in these content suggestions. I digress to make this point because I think it’s strange that Google doesn’t leverage existing technology from Google News, but instead appears to be developing separate (and frankly superior) ways of surfacing personalized article content in parallel with Google News. I’ll save my speculation for another post, but I will say this: there’s starting to be an awful lot of redundancy between Google News and the AI-powered Google content discovery features we’re talking about here, and redundancy in business usually results in consolidation. Just sayin’. Personalized: your personal search history, Gmail, and location are three of the primary sources used to generate personalized articles recommendations. Google could certainly bring in other data sources, like pretty much anything you’d find in My Activity, but those three are the ones that really stand out to me at this time. 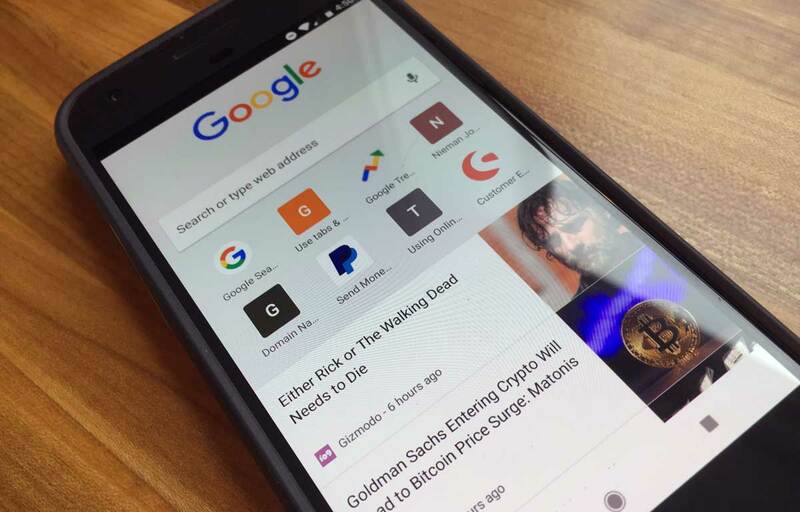 Trending: trending articles were introduced when Google retired Google Now and replaced it with the updated Feed experience. Presumably everyone sees the same trending article cards, but I’m not able to confirm that yet. How Do You Optimize for Content Suggestions? Implement Google AMP, if you haven’t already, and make sure your pages are error free. AMP isn’t required, but since 72% of these results are AMP, it’s probably a darn good idea to use AMP if you want to show up here. Implement feature-specific strategies and tactics — personalization aspects aside, what works in Articles for You and Cards will be similar to what works in Google News, Top Stories, QDF results, etc. The thing all of those features have in common is they have a heavy bias toward recency, and they’re not subject to the link-influenced algorithms that are still important in Google’s regular organic results. To put it another way, don’t use an evergreen SEO strategy and expect to show up in features and SERPs that only show fresh results. Get more email subscribers. Many publishers have prioritized this in 2018 already in an effort to become less dependent on the big platforms. But the fact that Gmail is a significant source of personalization data (there’s literally a “Cards based on your Gmail” setting in the Google App) means getting your links in your user’s inboxes might also mean you’ll show up more in their personalized article recommendations. Implement robust Schema.org markup on the article level and train editors to use it effectively to help Google connect the dots. Some smart SEOs saw some of this coming years ago, referring to “Search Without SERPs” and “Zero Blue Links,” and most recently we saw Google experimenting with Zero Result SERPs. So the fact that Google’s been heading in this direction isn’t really news. We’re just seeing a continued evolution, as Google moves from proof-of-concept (I’ve personally never found Knowledge Panels in search results all that useful) to AI-powered, entity-based content recommendation and discovery features (now that’s useful). Right away it’s clear that the personalization is based on my location (I live in the ‘burbs outside of DC-Baltimore), but what many SEOs will see when they look at this is a group of entities from Google’s Knowledge Graph. Distinct entities are what make up the Knowledge Graph, and this has been a major focus of Google (and SEOs) for roughly the past six years — things, not strings. Use the Interest and Demographic data in the Google Analytics Audience reports to identify new topics and categories that are most likely to show up in content suggestion features. Here’s an example: let’s say you’re a financial site and you’ve been writing keyword-targeted investing content from every conceivable angle. By applying a “Chrome Content Suggestions” segment in Google Analytics and viewing Affinity Category data, you might find that the #1 affinity category for your audience members who click on Articles for You links is Food & Dining/Cooking Enthusiasts/30 Minute Chefs. Google already knows that these folks like your site because they’ve visited it before. Now if you just align more if your content with your audience’s high affinity interests — even outside of your investing lane — you’re going to show up in their personalized recommendations much more frequently. What I’m really talking about is being as audience-focused as you are topic-focused. If you have a large investor audience who happen to love wine and cooking, make sure work some wine and cooking articles into your editorial mix. 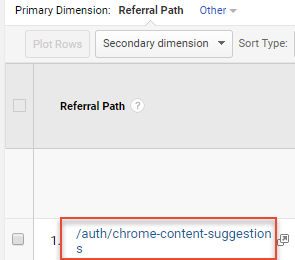 You can find affinity categories specifically for Chrome Content Suggestion users by applying that segment to the Google Analytics Audience reports and seeing what it reveals about your audience. The ad industry got the memo on this years ago; advertisers are interested in your audience, not your content. Writing the content your audience is searching for has been SEO in a nutshell for most of my career, and it’s what any good keyword researcher is ultimately trying to figure out. But in 2018, it’s less about finding more keywords under a given topic and more about addressing the broader needs and interests of your audience based on interests, both implicit and explicit. So What Do “Entities” Have to Do with This? When Google attempts to understand the topic of your articles, what they’re really doing is mapping your article topic to a known entity in the Knowledge Graph. 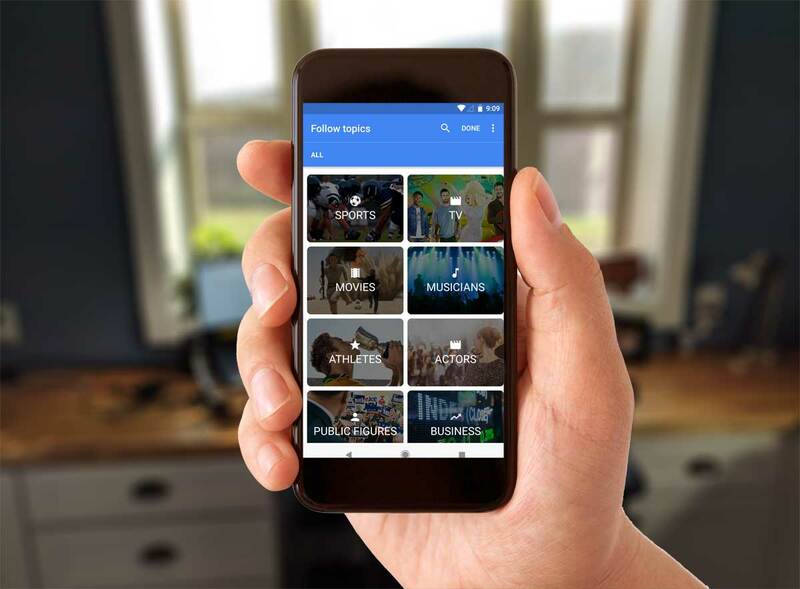 The Cards results in the Google App provide some insight into the entity mapping because it labels each content recommendation with a known entity at the very top. The example below is from my testing. 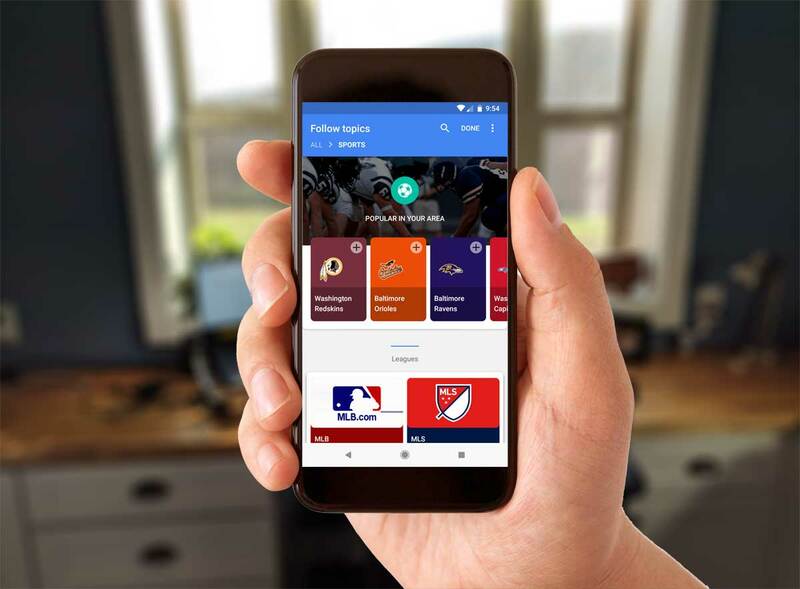 I indicated an interest in the Seattle Mariners to confirm the Google App settings are used in Chrome Content Suggestions. I picked Seattle Mariners because a) I live nowhere near Seattle and am not a Mariners fan, and b) I don’t even follow baseball. 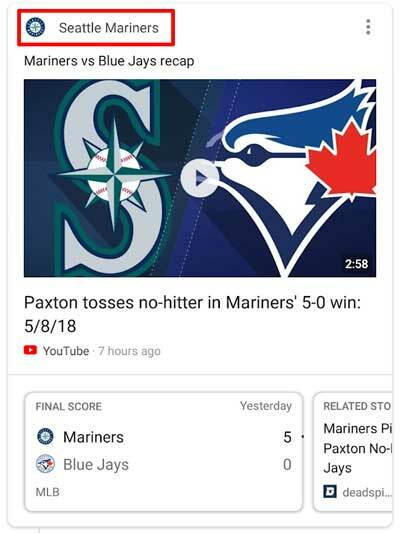 So when I see article recommendations for Seattle Mariners, I’m reasonably certain that’s being generated by my explicit setting in the Google App. Since Google is interpreting my content and attempting to match it to a known entity in the Knowledge Graph to drive personalized content recommendations, I conclude that it’s a very good idea to use Schema.org markup to make it easy for Google to connect the dots. Consider making your implementation and use of Schema.org more robust by leveraging the mentions property (to map entity relationships) and sameas property (to disambiguate), which will make entity-mapping easy for search engines. Are Content Suggestions the Future of SEO? Chrome’s Articles for You and Google’s other Cards features are relatively new, high visibility places for Google to surface article content from publishers. The specific features and access points will continually evolve, but given Google’s new $300 million Google News Initiative, I think it’s likely they’ll continue to introduce similar discovery features to surface publisher content. Still, not all users like having content suggestions foisted upon them at every turn, especially in such important and heavily used tools as their Chrome browser. Time will tell if users will adopt these new features, but until then, SEO (especially for news publishers) will continue to evolve rapidly, becoming less about ranking in the SERPs for specific queries, and more about understanding context, intent, and interests to keep your audience coming back to your site more frequently and staying longer when they get there. That’s an excellent point and one I considered as well. Intuitively it makes sense that they’d leverage their own G+ data help bubble up content suggestions. Since they also pull in the Twitter firehose, it’s also possible they run some analysis on that to identify trending content. Let me know if you find evidence linking G+ activity to exposure in content suggestions! Hi Jim! I’m recently seeing a big drop in traffic from this source (started in June, steeper now). Have any idea what it could be? It corelates somehow with Chrome version 67, but otherwise I have no clue. During most of the year after I began posting regularly to G+ this traffic was up more than 3,000% over the previous year. I stopped posting three weeks ago and will monitor the traffic to see if it has any effect. Januszo: I’m not seeing a drop as you describe. In fact, on one of the larger sites I work with, first week in July was the second best ever from this source. Tony: Thanks so much for sharing that. I look forward to your results! Pedro: That seems like reasonable theory. Hopefully I’ll get some more time soon to test some of this. I’ll second this. We had quite a bit traffic increase coming from this source right after we published an article that was heavily shared on social (Facebook mainly).